Spain has warned Argentina that it will face retaliation over its decision to nationalise the Spanish majority stake in the YPF oil company. Foreign Minister Jose Manuel Garcia-Margallo said Argentina had "shot itself in the foot" and damaged relations. The majority stake in YPF is owned by Spanish oil firm Repsol. President Cristina Fernandez said its expropriation was aimed at "recovering sovereignty" over natural resources. The nationalisation alarmed investors but is said to be popular in Argentina. Repsol has said it will demand compensation of up to $10 billion (£6.2 billion) for its 57% stake. The rhetoric shows that there is real anger in Madrid but the best course of action for Spain's government now is less clear. It will want to send a signal to Buenos Aires to show that its plan to take over Repsol's stake in YPF is not acceptable. However Spain and Argentina are strong trading partners, and when your economy is facing trouble at home, you need all the help you can get from abroad. There will also be concern over other large Spanish companies based in Argentina, like the mobile phone operator Telefonica or Spain's biggest bank, Santander. Madrid already has support from the EU and, on his scheduled trip to Colombia and Mexico, Spain's Prime Minister Mariano Rajoy will want to garner support in Argentina's immediate region. "These acts will not remain unpunished," Repsol executive chairman Antonio Brufau told reporters. Spanish Prime Minister Mariano Rajoy said Repsol's share was being expropriated "without any justification". "I must express my profound unease. It's a negative decision for everyone," he said on a visit to Mexico. European Union foreign policy chief Catherine Ashton said Argentina's decision sent a "very negative signal" to investors. "The measure creates legal insecurity for all European Union and foreign firms in the country," she said, adding that the EU was considering "all possible options". UK Foreign Secretary William Hague also voiced concern. "This goes against all the commitments Argentina has made in the G20 to promote transparency and reduce protectionism," he said. "We will work with Spain and our EU partners to ensure the Argentine authorities uphold their international commitments and obligations." Argentine President Cristina Fernandez de Kirchner has dismissed the threat of reprisals. "This president isn't going to respond to any threats... because I represent the Argentine people," she said. "I'm the head of state, not a thug." She announced the nationalisation to applause on Monday at a meeting with her cabinet and provincial governors, saying energy was a "vital resource". The government took over the management of YPF with immediate effect and the bill on expropriation is being presented to the Argentine Congress. Deputy Economy Minister Axel Kicillof - who has taken charge of YPF - told senators the government would not be meeting Repsol's full demand for compensation. He accused Repsol officials of exaggerating the company's true value and said environmental clean-up costs would be deducted from any compensation. "We are not going to pay what they want," he said. 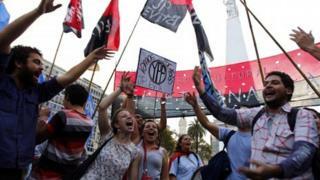 Supporters of the expropriation have been celebrating in Buenos Aires, waving placards that read "YPF - we're going for everything". President Fernandez accused Repsol of failing to invest and develop new oil and gas resources, forcing Argentina to import energy. However, Repsol has recently discovered one of the world's largest deposits of shale oil and gas at Vaca Muerta in western Argentina. And analysts say the government's policy of fixing energy prices has discouraged investment. Mrs Fernandez stunned investors in 2008 when she nationalised private pension funds and she has also renationalised the country's flagship airline, Aerolineas Argentinas. Many Argentines blame free-market policies such as the privatisations of the 1990s for the economic crisis which resulted in a debt default in 2001-02. Repsol's executive chairman Antonio Brufau accused President Fernandez of resorting to nationalisation "as a way of hiding the economic and social crisis which Argentina is suffering". Argentina's crisis, he argued, was rooted in "a mistaken energy policy". He accused Argentina of running a campaign of "harassment" in recent weeks in order to push down the price of YPF shares and get a bargain price for the expropriation. Repsol shares fell 7% in Madrid on Tuesday in response to the expropriation. Repsol's Argentine partner, the Eskenazi family's Grupo Petersen, has a 25.5% stake in YPF which will not be affected by the nationalisation. However, Reuters notes that it is unclear how Petersen will be able to repay a $1.9bn loan provided by Repsol. YPF nationalisation: Is Argentina playing with fire?